All discussion related to this thread belongs in the discussion thread. As you can see, the formatting has changed a bit. I decided instead of being all fancy with it to just keep it simple and to the point. 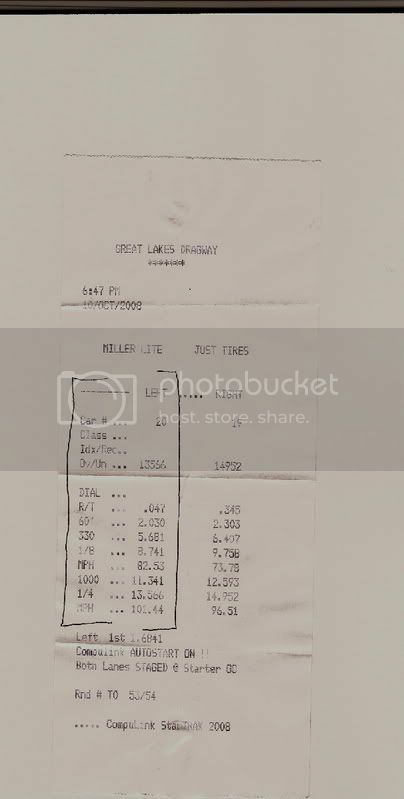 Key ingredients that were missing before such as 60ft and 1/8th mile times are now input as anyone that is big into drag racing knows, the 1/4 mile is mainly decided by the front half of the track. The times are listed as well as the vehicle type and basic key mods. I will keep the thread updated as they come in. The previous rules apply. See Below:Time slips, videos or other proof or you don't get on the list. Please post relevant mods and you can post a single pic of the engine and/or car if you'd like. All times are in seconds and speed in miles per hour. Keep discussion out of this thread please. FWD SR20DE (Naturally aspirated, non VE head). FWD SR20DE(+)T (Forced induction including superchargers and nitrous, non VE head). 6 savage 2.07 8.1@91.1 12.41@114.2 B13 SE-R - 17psi, T28, cams, slicks. 8 ashtonsser 1.8 7.98@87.3 12.44@109.5 92 B13 SE-R - 12psi, T25, cams, slicks. 1 pito 1.66 7.05@ ? 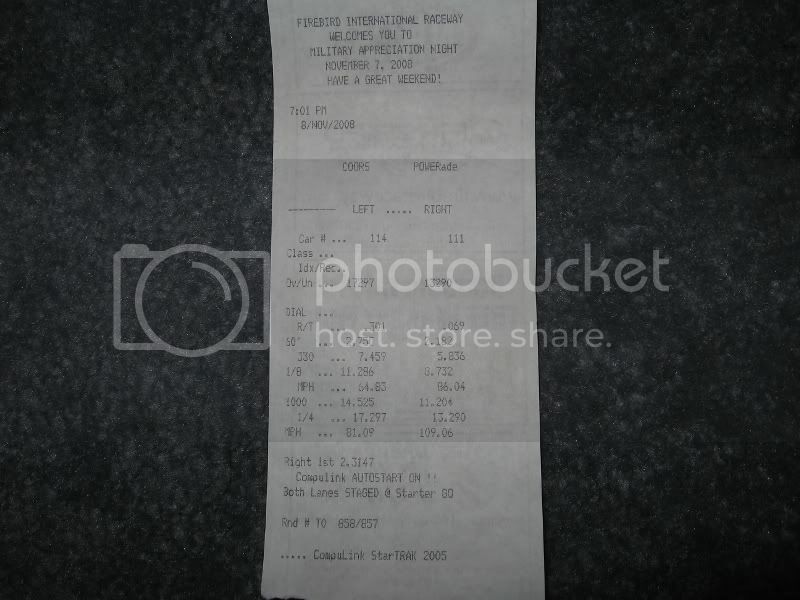 10.99 @123.55 B13 SE-R - 2.45L VE, N1 cams, Xcessive Intake Manifold, Big header w/ Reverse cone, significant weight reduction. 9 nizmo 2.19 9.08@80.50 13.97@100.22 N15 Lucino – 2L VE, SR16 non-n1 Cams, Pop Charger, Header, Exhaust, SR16 Trans. FWD SR20VE-T (Forced Induction, VE Head). RWD/AWD Vehicles (N/A or Forced Induction). Topdog781, and ga16eats like this post. 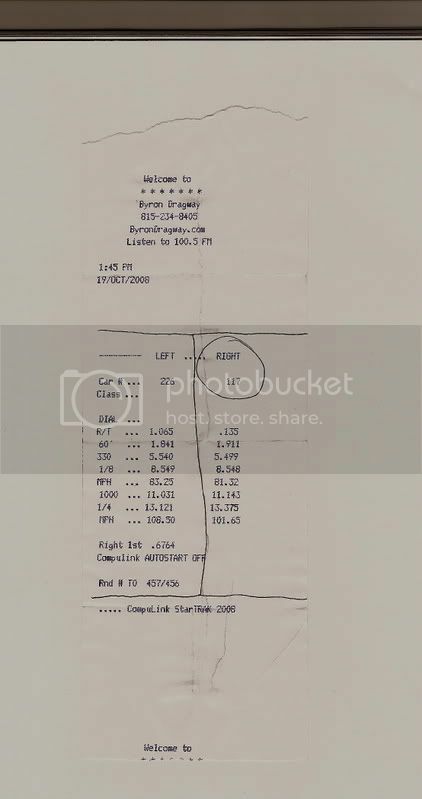 10.5 @ 149.2mph to date I believe the fastest trap speed SE-R, Much more to come with some changes! Here are my times on this setup. I have vids but the timeslips are way too dull to get pics of and i dont have a scanner. This run would have been probably a 12.0-1 @113 had i not lost a cylinder 300ft before the end. haha but still coasted to that. I gots a new time. SR20DE: 3" CAI, '91 high port cam, SSAC headers, 3A Racing muffler, 19* timing. 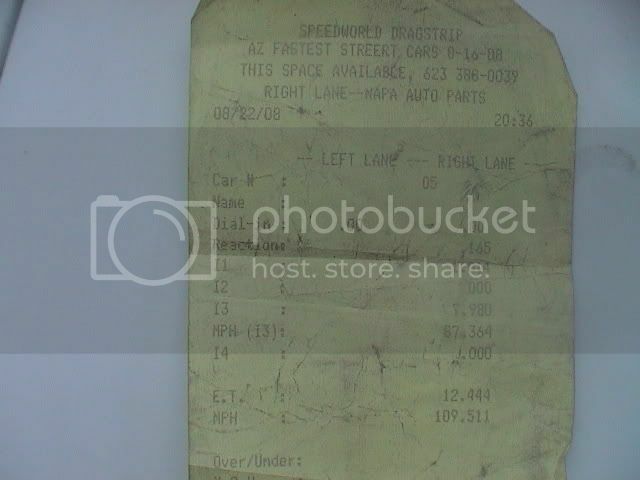 I got a slip to add, but its not my car... well @ least the Sr20 powered car isn't mire. I'll let the owner chime in on his parts list when he gets a chance. My setup is pretty simple. Motor had some head damage on #4 cylinder for about six months now ,caused by a previous Cometic HG failure, but still pulls hard. Just smokes a little. I was trying to hit mid 11's before I fix it but this is close enough. Time to pull it apart then shoot for low 11's.